xmlns:og='http://ogp.me/ns#' Yeah. Good Times. : Happy Birthday Child 2!! My baby boy is 6 today. SIX. I thought about maybe talking about my birth story but it's really nothing more exciting than the OB saying "How's the 21st for you?" and me saying "Sure, I'm not doing anything that day except having a baby, I guess." 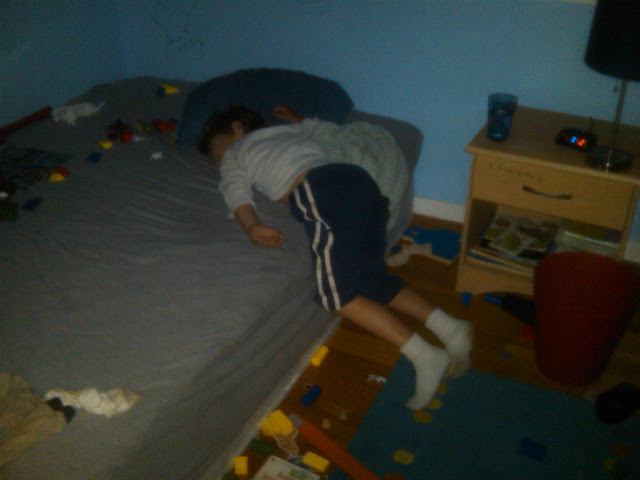 Here's a picture I took the other night; this is exactly how we found him sleeping when we got home. I expect that in about 10-15 years his friends will be taking similar type pictures of him, but I won't get to see them. I thought I might save this and show it to every girl or guy that he ever brings home, but I think it's special enough that I should save it for when he finds "the one."